PRODUCT: WESTERN COLLOID #800W WHITE ELASTIC FLASHING CEMENT. A PREMIUM GRADE VERTICAL/HORIZONTAL ALL-PURPOSE FLASHING CEMENT. WATER BASED, ASBESTOS FREE, UV-RESISTANT, NON-FLAMMABLE. 3.5-GALLON PAIL. PRICE/PAIL. Ideal for all types of flashing under or over elastomeric roof coatings. Fills low / ponding water areas (apply in layers, 1/4" at a time, curing each layers). All Purpose, Vertical or Horizontal Applications. Will not bleed through white roof coatings. Compatible with all types of elastomeric roof coatings. Use for Vertical details on cold process built up roofing systems. Repairs cracks in masonry, stucco or parapet walls. Repairs and seal small holes in foam roofs, mobile homes, trailers, and RV roofs. Seals seams, flashing and screws on metal roofs. Repairs and seal A/C ducts, sheet metal gutters, metal coping and wall caps. Can be used to seal around skylights, vent pipes or other roof top projections. DESCRIPTION: Product #800 Elastic Cement is a water based, high-solids elastomeric flashing, patching and sealing compound. Its an all-purpose grade, formulated with premium latex rubber, acrylics, mineral pigments and non-asbestos fibers to form a permanently elastomeric waterproofing and sealing compound. 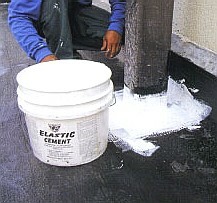 When cured #800 Elastic Flashing Cement forms a tough, flexible, elastic membrane that can withstand greater stress than ordinary plastic roof cement, flashing compound or even modified plastic cement. Product #800 Elastic Cement is a heavy bodied compound that can be brushed or troweled. Its both UV and chemical resistant. To prevent excess dirt pick-up, finish coat with and Elastomeric acrylic roof coating, such as Elastahyde 720. Will not flow at high roof-top temperatures. Climate formulated for year round applications. Water based: VOC free and meets all VOC requirements. Flashes Pipe Penetrations and also for build-up of low / ponding areas. OPTIONS: Also available in BLACK by special order. Fiberglass Reinforcement Fabric, White Color, 20 X 20 Mesh, Resin Coated, 4-inch Wide x 150 ft. Roll. An inexpensive import product. Price/Roll. 6 inch Putty Knife. Nylon Handle, Polished High Carbon Tempered Steel, Full Length Riveted Tang, Solvent Resistant Nylon Handle with Hammer Head Design. Price/Each. Greenslope #101 Ponding Water Repair Kit. 25 Lb Kit includes Rubber Granules, Styrofoam Beads, 1-pt Primer, 1-qt Adhesive, 3 inch Brush, Rubber Gloves, Mixing Bag. Ships in 5G plastic pail. Made in USA. Price/Kit. T272 Grade Stitch-Bonded Polyester Reinforcement Fabric, Fine Weave, Soft-Finish 3-Oz / Yard. 4-inch X 324 ft. Roll. Price/Roll. T272 Grade Stitch-Bonded Polyester Reinforcement Fabric, Soft-Finish 3-Oz / Yard. 6-inch X 324 ft. Roll. Used with Acrylics and other Liquid Roof Coatings. Price/Roll. WESTERN COLLOID #950, ACRYLIC BASED PRIMER, SEALER AND STAIN BLOCKER. 5-GALLON PAIL. PRICE/PAIL. WESTERN COLLOID #970 A2A, ACRYLIC-TO-ASPHALT AND PONDING SURFACE BONDING PRIMER. FOR SMOOTH ASPHALTIC / SBS / APP SURFACES. 5-GALLON PAIL. PRICE/PAIL.